Audience of Two presents: HORK! Five hundred years in the future, the universe’s misfits, mountebanks, and weirdos are all condemned to an eternity of torment in the prison-world of Game Over–the place where you go when you run out of continues. They say no one has ever dared to mount an escape…until now! Audience of Two is thrilled to present our first fully-produced original radio play. Originally born as a sketch comedy radio show at Swarthmore College, Hork! was one of the few episodes we produced back in the day that we felt had, as the pro’s say, “legs,” or as we say, “discernible characters, jokes, and a story (sort of).” Eight years later, and with no shortage of re-writes and touch-ups, it was an absolute thrill to hear it performed by our dynamite collaborators, set to the original music of Tom Swafford. We hope it will enliven your next otherwise-boring commute, road trip, or pasta-preparation (though headphones are strongly recommended!). We are so excited for you to hear and enjoy Hork! It’s priced at pay-what-you-will because the most important thing to us is for you to be able to check it out, so if all’s you got is 2 ears and $0, we sincerely thank you for listening! That said, this took us many many hours of writing and production (and some not-inexpensive audio equipment) to create, so we offer a suggested donation of $20, but would be grateful for anything you can contribute towards our ongoing efforts to ROCK YOUR MIND. We look forward to bringing you our next production very soon. BLAST OFF! Here’s a sneazy-peezy at the first five minutes of the “studio” version of HORK! Only five days till the live show! As some of you are aware, Ben and Sam started performing together on a sketch comedy radio show in college, which Sam started with the notorious Gerrit M. Hall. 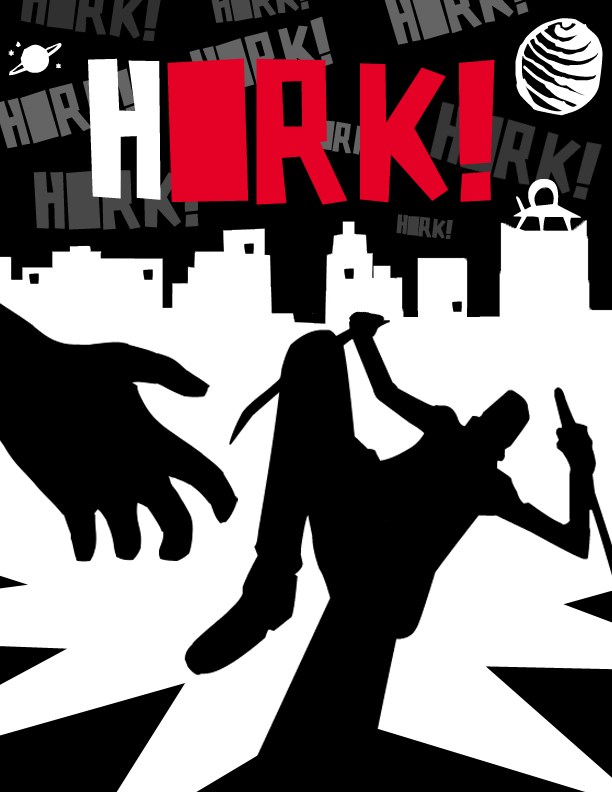 Towards the end of their sixth season on WSRN at Swarthmore College, Gerrit wrote an episode entitled HORK!, in which futuristic aliens and humans compete for moral superiority in a mysterious land called Game Over. Though the script was dyn-o-mite, the crew lacked the production skillz to truly give voice to Gerrit’s vision, and the nagging sense that an opportunity was missed has haunted each of their every waking steps since that fateful evening in late 2003. Featuring live sound effect mixing on stage by an almost-certain-to-be-flummoxed Sam, as well as an original violin score by Tom Swafford, this is guaranteed to be a night to remember, as well as a helpful cautionary tale about how seriously F&%$ed up the future is gon’ be. GIT YO TIX! Also, we’ll be releasing a very special “studio” version of the episode the very next day, on 2/20, recorded at Hootenanny Studios, where The Road 2 Shambala will also be broadcasting live this Sunday at 4pm, featuring the Ao2 team talking about the history and process of bringing HORK! back to life. Tune in! Come see us play singing holiday beavers this Thursday, December 16th at the PIT, as part of the 37th Annual J Hobart B All-Star Christmas Spectacular! Yeah, we know. Typecasting. We have a show of our own where we play ourselves doing sketches! It’s this Saturday! Also at the PIT! Friday is the last day to nominate us for Best Sketch Group at the ECNY awards! do you have to live in New York? Hell no! Can you nominate us more than once? Apparently! ABSORB THIS INFORMATION AND ACT ON IT AS YOU SEE FIT. WE LOVE YOU ALL VERY MUCH. Our latest and greatest original sketch. BONUS BOOGIE WOOGIE INFO JAMZ: Come see us performing live at the PIT tomorrow night at 7pm! So nice we had to post it twice. Have you ever wondered what Ben looked like at age 15? CLICK YON VIDEOJAMZ.